I finished my little 4 patch quilt the other day. As you know, I had a terrible time deciding on a border fabric. As I was putting some fabrics away, I spied another choice altogether. This I could be happy with, not too light and not too dark. The backing fabric came from a FQ that my hubby surprised me with on one of his shopping trips. I am pleased with this quilting choice also. I actually used a rather bright green thread but it blended well with all the scraps. It gives texture without competing with the piecing. All in all, a happy little quilt! 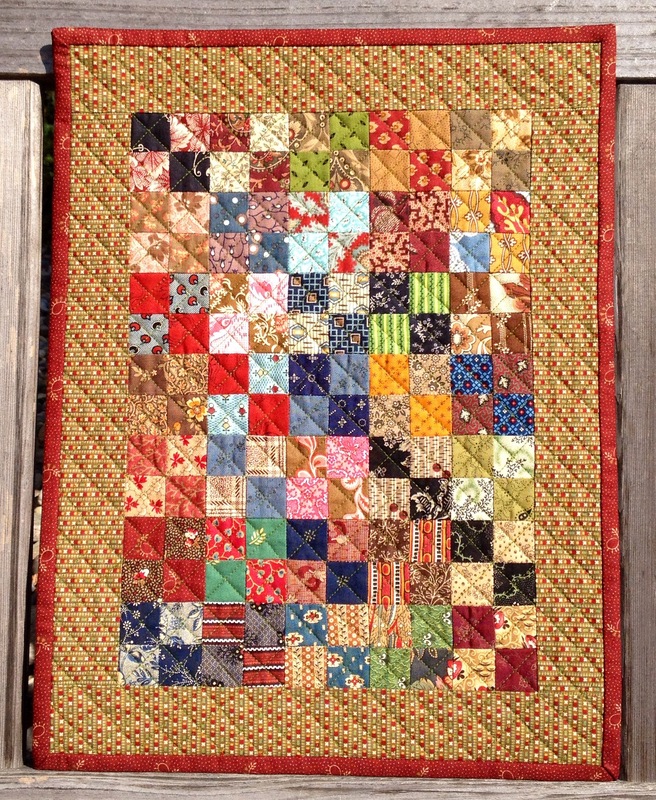 I think I should call it, Inspired by Inspired By Antique Quilts! Thanks, Kathie! Click here to get a little inspiration for yourself! Linking up with Confessions of a Fabric Addict for Can I Get a Whoop Whoop?, Lorna at Sew Fresh Quilts for TGIFF, and Richard and Tanya Quilts for Link a Finish Friday. This entry was posted in Civil War Repro Quilts, Doll Quilts, Finishes, Miniature. Bookmark the permalink. Very cute, just love civil war fabric in minis! Adorable mini quilt!! Really great color palette! Love the border fabric you decided on. Nice job! An adorable mini…. Love the antique feel of it! 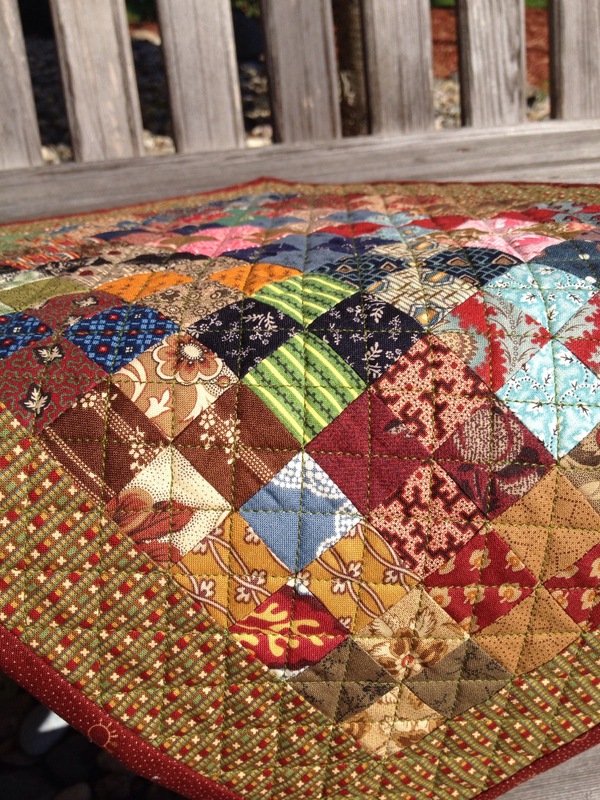 And the quilting looks fabulous! great quilting choice and border choice. I love the texture it gives and using a green thread perfect , we all need to think outside the box and go for what works for us. thanks for sharing I love that you made it! Turned out well! I especially like the way the border line appears and disappears, and the way the eye is drawn to the black and red diagonal. You created a lot of visual interest with a simple four-patch block. The border and binding are perfect for this little gem. Great job, Katy! 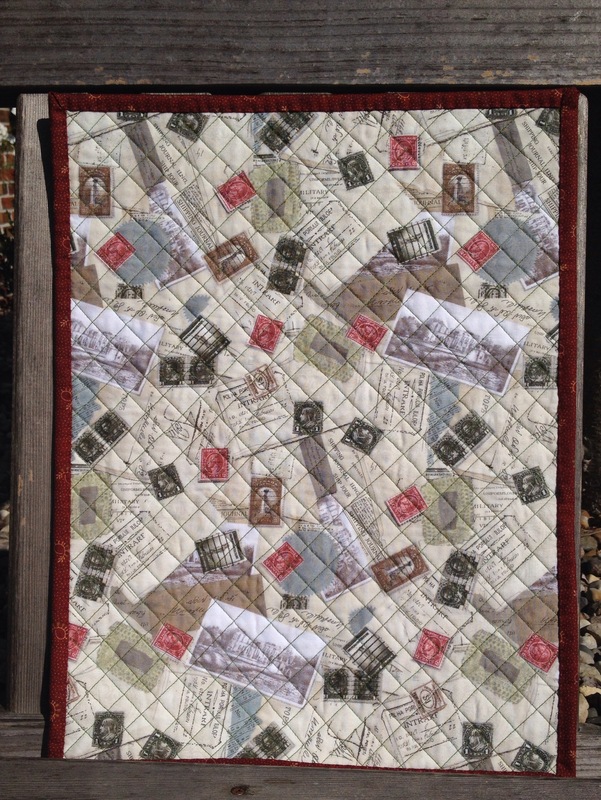 Nice little quilt – the border is a good choice ! Your little quilt is so perfect! The border is perfect! Good eye. What a fabulous little quilt! I love it! Fantastic choice on the border … and great job on the binding … it adds a nice pop and a nice finishing edge. Love this!